For this study, researchers reviewed 680 primary HNCSCC tumors in 459 patients. The 8th edition of the American Joint Committee on Cancer (AJCC) Cancer Staging Manual (AJCC8) tumor (T) classification for head and neck cutaneous squamous cell carcinoma (HNCSCC) demonstrates improved homogeneity and monotonicity compared with the 7th edition (AJCC7), according to the results of a 10-year retrospective cohort study published in JAMA Dermatology. The investigators sought to compare the AJCC7 and AJCC8 tumor classifications for HNCSCC and to validate the AJCC8. The study, which was conducted between 2000 and 2009 at an academic tertiary care center, evaluated a total of 680 primary HNCSCC tumors in 459 patients. The tumors were examined for disease-related outcomes including local recurrence (LR), nodal metastasis, (NM), and disease-specific death (DSD). 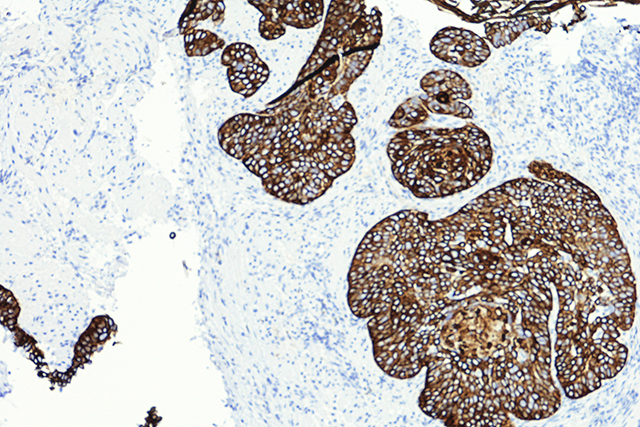 All tumors were stratified according to AJCC7 and AJCC8 tumor classifications. Distinctiveness, homogeneity, and montonicity were assessed for both classification systems. Overall, 68.0% of the patients were men, 98.3% were white, and 82.8% were immunocompetent. Median age at diagnosis was 72 (range, 35 to 94). Approximately 59% of the tumors were well differentiated, 21.6% were moderately differentiated, and 19.1% were poorly differentiated. High AJCC8 tumor categories (T3/T4) accounted for 17.8% (121 of 680) of total tumors, with this small subset responsible for 70.4% of all poor outcomes (LR, 11.8% [4 of 34]; NM, 12.5% [3 of 24]; and DSD, 38.5% [5 of 13]). In contrast, few tumors (0.7%) and only 16.9% of poor outcomes occurred in high AJCC7 tumor categories (LR, 11.8% [4 of 34]; NM, 12.5% [3 of 24]; and DSD, 38.5% [5 of 13]). Homogeneity was assessed by comparing the percentage of poor outcomes in low AJCC tumor categories (T1/T2), and monotonicity was evaluated by comparing the percentage of poor outcomes in high AJCC tumor categories (AJCC7 T3/T4 vs AJCC8 T3/T4b). Approximately 83.1% of poor outcomes were clustered in low AJCC7 tumor categories (LR, 88.2% [30 of 34]; NM, 87.5% [21 of 24]; and DSD, 61.5% [8 of 13]). In comparison, only 29.6% of poor outcomes were reported in low AJCC8 tumor categories (LR, 35.3% [12 of 34]; NM, 29.2% [7 of 24]; and DSD, 15.3% [2 of 13]. AJCC8 tumor classification demonstrated significantly superior homogeneity and monotonicity to AJCC7 tumor classification (McNemar P <.001 for all end points of interest). A total of 96 tumors were upgraded from AJCC7 T2 to AJCC8 T3; 18 LRs, 14 NMs, and 6 DSDs were included. Tumors upgraded from AJCC7 T2 to AJCC8 T3 have an increased risk for poor outcomes. Results of the study showed that AJCC8 T2, T3, and T4 combined comprise a 23.1% subset of CSCC that contains nearly all poor outcomes, which merits population-based validation to improve AJCC CSJJ staging. The investigators concluded that additional research is warranted in order to validate AJCC8 with population-level data and to compare the performance of AJCC8 with that of other tumor classification systems.